We are managing hard times, with grief, shock, anger, fear, and too often, sleeplessness. Which makes our feelings more distorted and reduces our ability to act and live our lives. It’s painful to experience, painful to see. I’m grateful I can help. 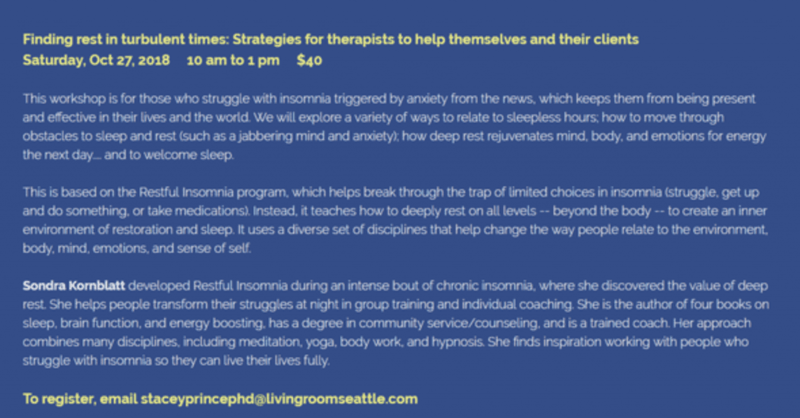 In this workshop, we’ll learn tools to get space around emotions to welcome rest (and sleep). Will you be in Seattle on Saturday, October 27? Do you know of anyone here who might need some help with sleepless nights – for themselves or their clients? I’d love to see you. Click here for more information. And would you forward this to any therapists *(and physicians, naturopaths, or other practitioners) who might find it helpful? I’d appreciate it! P.S. If you have a friend who you believe would benefit from reading this post, I’d be grateful if you’d pass it along. Thank you!